The 2019 SSA Annual Meeting offers three exciting field trips. Hardy participants will view iconic clues to great earthquakes on the Cascadia subduction thrust. The clues tell of recurrent subsidence and associated tsunamis in the past 2,000 years. 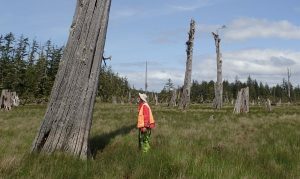 Highlights include one of the estuarine ghost forests that identifies Cascadia as the likely source of a Pacific Ocean tsunami in January 1700, and which provides tree-ring evidence for an unusually long recurrence interval before then. The trip bus will depart the Westin Hotel in Seattle at 8 AM and will reach the Copalis River, on Washington’s outer coast, three hours later. Participants will spend four hours paddling canoes, inspecting muddy river banks and walking in a ghost forest. Return to the Seattle Westin in late evening. This trip explores the geomorphology and stratigraphy of Seattle that record the history of crustal faulting and determine site response to earthquakes on all sources. Participants will leave The Westin Seattle at 8:30 a.m. by bus to the South Beach of Discovery Park, which offers views of glacial stratigraphy and evidence for recent sea level change. 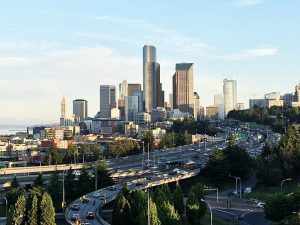 From there, the tour heads to scenic Jose Rizal Park, where participants can see downtown Seattle and the lower Duwamish River delta, before continuing on to historic Alki Point for lunch and discussion of the last large earthquake on the Seattle fault. After that, the tour visits Terminal 107 Park, where Duwamish stratigraphy and evidence of uplift from sediment peels can be seen alongside public art installations. Participants will follow a short trail to the edge of the park, where a dry outcrop displays uplifted tide flat and riverbed deposits. The final stop of the tour is the Diagonal Avenue South Public Shoreline to view sand dikes and vented sand volcanoes. Waders or change of shoes/clothes are recommended due to sticky mud. The bus will stop at The Pike Brewing Company at 6:30 p.m. before continuing directly to The Westin Seattle. Participants who wish to stay and visit the brewery will be dropped off and responsible for returning to the hotel (approximately a 10-minute walk). Bring shoes appropriate for a ~2 mile walk with 250 ft. of elevation gain, sandy beach, cobbled beach, riprap and muddy river bank. Waders or tight-laced shoes and a change of clothes are recommended for the final stop. Ralph Haugerud (U.S. Geological Survey), Elizabeth Barnett (Shannon & Wilson, Inc.), Bill Laprade (Shannon & Wilson, Inc.) and Elizabeth Davis (University of Washington). Take a tour of the University of Washington campus and its seismic research facilities, including the Pacific Northwest Seismic Network (PNSN), the Rapid Response Research Facility and UW Oceanography’s newest research vessel, the Rachel Carson. Attendees will depart the Westin Seattle at 7:15 a.m. and ride the Link light rail to the UW campus. The tour starts at 8:00 a.m. at PNSN’s headquarters. Attendees will learn about the daily operations of the seismic network, the seismic hazards unique to the region, as well as the network’s ongoing projects, such as the implementation of earthquake early warning. Next, attendees will visit the RAPID facility’s equipment library, which houses items ranging from LIDAR and surveying equipment to unmanned aerial systems. Attendees will also learn about facility operations, including reconnaissance and data acquisition in post-disaster situations and software development. The tour concludes with a look at the R/V Rachel Carson at the UW docks. 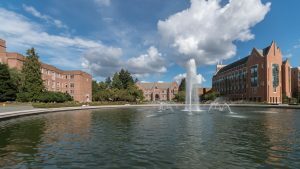 Attendees will learn about its laboratory, specialized tools and the role it plays in UW’s seismic exploration of the Puget Sound and surrounding coastal areas. Attendees return to The Westin Seattle at 11 a.m. Walking shoes are recommended. Be prepared for rain. Lunch is not provided. The PNSN and RAPID facility are both ADA accessible, but the R/V Rachel Carson is not.